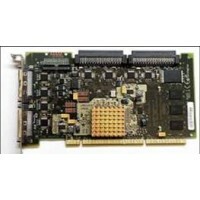 Provides a PCI-X Disk/Tape SCSI Controller with zero write cache and without RAID support. Disk mirroring support is supported through i5/OS. A maximum of six disk drives are supported on the #5736. Removable media devices (tape, optical libraries, CD-ROM, DVD-ROM, or DVD-RAM) are also supported on the #5736. The #5736 has two U320 buses each with a bus data rate of up to 320MBs. Each SCSI bus can be either internal (using an internal port) or external (using an external port), but not both. There are four physical ports on the #5736, two internal and two external. A maximum of one external port per #5736 controller can be used for an EXP24 Disk Enclosure to attach one six-pack of disk. The #0300 specify indicates to the IBM Configurator tool is being used in this manner. #0647, #5736, #5766 and #5775 are physically the same adapter card but have different feature numbers to indicate to IBM configurator tools that an IOP is or is not being used in the configuration. #5736 should be the choice over #5702/#5712 or #5705/#5715 controllers for systems running V5R3, or later. Attributes provided: Two Ultra320 SCSI VHDCI ports that may be either internal or external but not both.